Fast Cash Biz Scam-A Faster Way To Lose Money!! Fast Cash Biz is a new binary options software that can generate unlimited wealth! The developers of this software are David Graham & Madison Clarke, who are most probably paid, actors. We tried to find them on the internet, social media but we failed. The promotional video is very long, about 30 minutes. It gives us a lot of hype and BS and not enough discussion about the software and how it works. We just got a whole bunch of screenshots of how much money they made, but not how it actually works. The promotional video has really good production values compared to most Binary Options software out there. Instead of PowerPoint presentation with a narrator, they have obviously heavily invested huge cash into the video production. Hiring actors, renting a Bentley car, renting a private jet and so on and on. Sadly, this is really just so they can sell you a Dream, posh lifestyle, not anything that has true value. The thirty-minute long video starts with the two actors telling you they have made $55 million dollars in just 3 years using the Fast Cash system. Screencasts are very useful to unethical marketers as it allows them to showcase what seems like the truth. In reality, they can be very easily manipulated to show whatever they want, including excessive bank account balances. Even we can show you our bank balance like 2 Trillion within minutes by using Photoshop software! The Fast Cash.Biz website and promotional video have been made with one purpose in mind, to sell you the dream that Binary Options software systems can generate millions of dollars by itself. They barely mention what is behind their system in the video. In fact, we can’t remember them, saying anything about the system except that they don’t want to “bore you to death” with the details. In the FAQ section of the Fast Cash.Biz site, they claim that their success rate is 100%. Well, in binary options trading no one can win 100% and even a newbie knows it. It’s all about keeping the winning ratio over the loss ratio, that’s how it works. So 100% winning is not acceptable. And they said that Fast Cash Software can generate 10,000$ per day while completely running on autopilot. Well, if you know a little about Fundamentals, then you know that everyday financial news comes out so often and moves currency pairs, stocks, commodities like crazy within a certain direction. Good traders take extra caution during that time. A robot software that completely runs on autopilot has no human intellect, it doesn’t know what the economy is like. So how come it generates such amount of money on autopilot! They said the Fast Cash software is completely free, but it’s not. In order to activate the software, you need to deposit 250$ to their nominated broker account which is not regulated. And then after activating the software, when you turn it on autopilot the start manipulating your trades to make a lose your money and your broker will ask you to deposit further. This is the common scenario and that’s how they cheat your hard-earned money. We ask you not to fall for Fast Cash Biz scam. Thanks for the heads-up Doctor. There are so many scam Binary Options websites sprouting nowadays. Will sure avoid this one. Thanks for the warning on this terrible scam Doctor – i hate all these scams including Fast Cash Biz and all the other stupid names they come up with! Yes! Finally a useful review. Thanks Doc. I have used this system and lost a few hundred dollars in 3 days. But there are a lot of positive comments on the BOWD site. It appears that this system only works for some users but NOT all users. It is very much broker dependent. Hello there! This post couldn’t be written any better! Reading this post reminds me of my good old room mate who got scammed! Thank you for sharing! Why these scammers don’t sleep! they are nothing but asses! This is how people lose their money fast! You have been acting as a volunteer to guide the traders not to fall for any scams. I appreciate it and if you need any help don’t hesitate to remember me.Keep up the good work. Thanks for sharing such a good article. 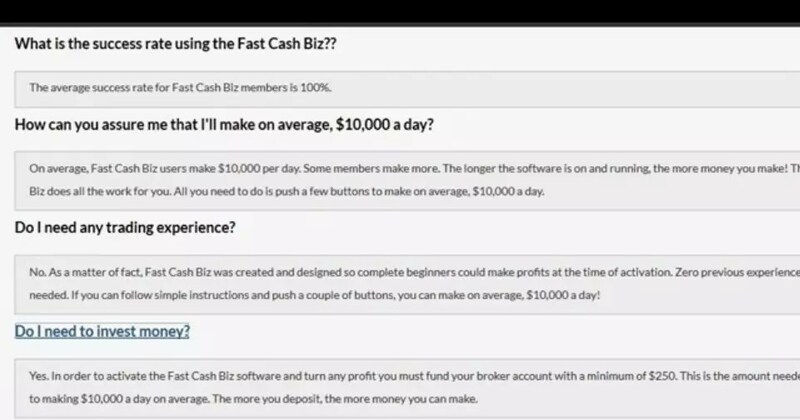 Fast Cash Biz is a fake profit generating software. Yes it was a costly,scammy production! Fast Cash Biz is a fancy scam. Excellent article here! Fast Cash Biz is a scam. I was the victim of this fake fastcashbiz software. It’s still advertising heavily over the internet. Avoid this system. Hi there, You’ve performed an excellent job. I will certainly digg Fast Cash Biz and in my view recommend to my friends. I totally disagree with this review. I have joined Fast Cash Biz 2 months ago and I am getting 78% ITM. I know you won’t approve my comment but that’s the reality.